As advertised by the weather forecasters, today was windy, cool and rainy here in the RGV. 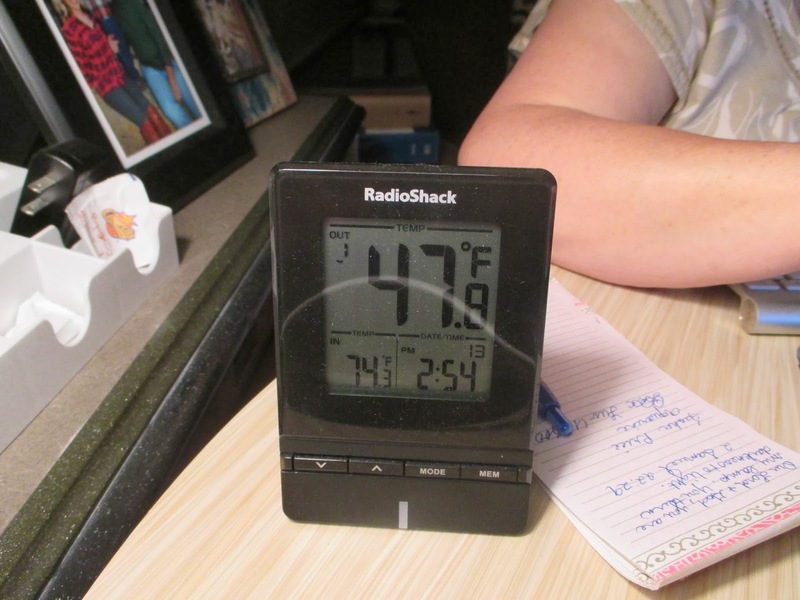 A cold front blew through during the night, and the outside temperature plunged to 47 degrees, which is unusually cold for this area. A quick check of other cities, like at our home near Fort Worth (34 degrees) and Chicago (7 degrees) reminds us why this area is so attractive to folks from up north. (There is a large contingent of Canadians here in the park.) It is usually quite rare that wearing shorts would not be desirable here year around. Fortunately, cool spells like this are short lived; within a day or two, we will have 80-degree days again. Since any plans that may be made by us retired folks are usually said to be in 'Jello,' a day like this that keeps us inside is no big deal. We just get caught up on household chores or another activity like writing this post. Almost everything that may have been scheduled outdoors can either be moved indoors at the many venues available here or merely postponed, for there is always, always tomorrow. lunch at Beto's, one of our favorite local restaurants. We decided to take a break from doing nothing and chose the lunch option, as it is usually late morning when we start thinking seriously about food. 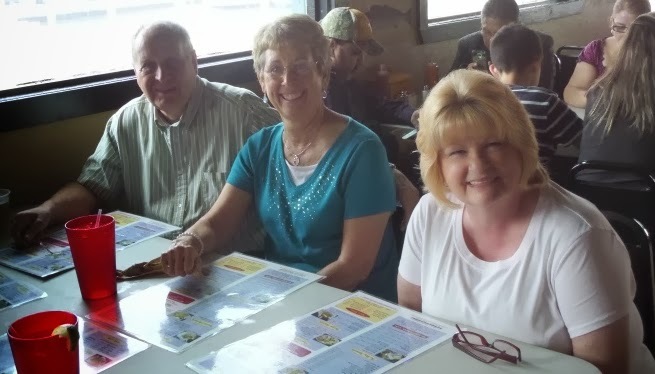 Ron and Verna joined us at Beto's, and we had great fellowship laughing our way through the excellent and plentiful home-cooked fare. You would think we would eventually run out of funny material, but none of us takes life very seriously, and we all have enough foibles and eccentricities to provide ample fodder for hilarious anecdotes and putdowns. All of the folks we have met here can take in stride the good natured harassment and dish it out just as deftly, so no one has to tiptoe around anyone's delicate feelings. 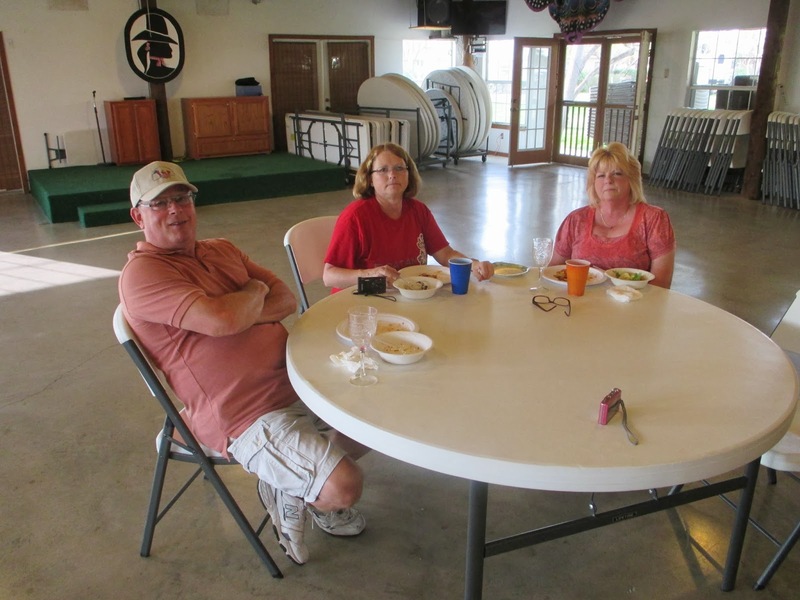 After lunch, Sandy made some phone calls, and I had time to add to this post, reflecting on yesterday's activities, which included a mini get-together at one of the park's activity rooms. 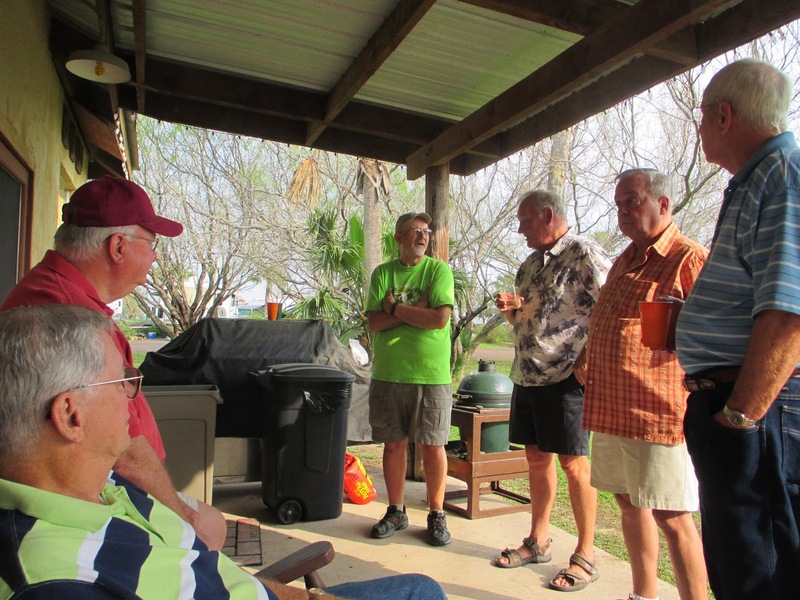 Several of the regulars showed up to swap stories and eat some snacks, and we even had an impromptu recitation performed by an elderly gentlemen who happened upon our little gathering. He had entered our room, uninvited but not discouraged (we are nothing if not polite), and sat silently against the wall for some time listening to our spirited banter before arising and walking over to where we were seated in a semicircle. Then he began a lively recitation of "The Cremation of Sam McGee," a lengthy classic poem by Robert W. Service, published in 1907. It was a remarkable feat of memorization, and his expressive performance caused us to speculate that he may have had some experience as a thespian. Upon completing the recitation, he departed quickly, and we marveled at this bit of serendipitous entertainment by a complete stranger. Adding to the eccentricity of his performance, the old man appeared to be wearing a woman's blouse, but that simply heightened the intrigue. We all agreed this was something we didn't see every day and voiced our hope that his man-blouse was not a harbinger of future men's fashion. This was one of those times that I wish I had had enough presence of mind to take a photo. No one in our group did, probably because of our utter surprise at the actions of our anonymous visitor. Now, back to today: After lunch at Beto's, Ed suggested that we go down to the rec hall and play games. 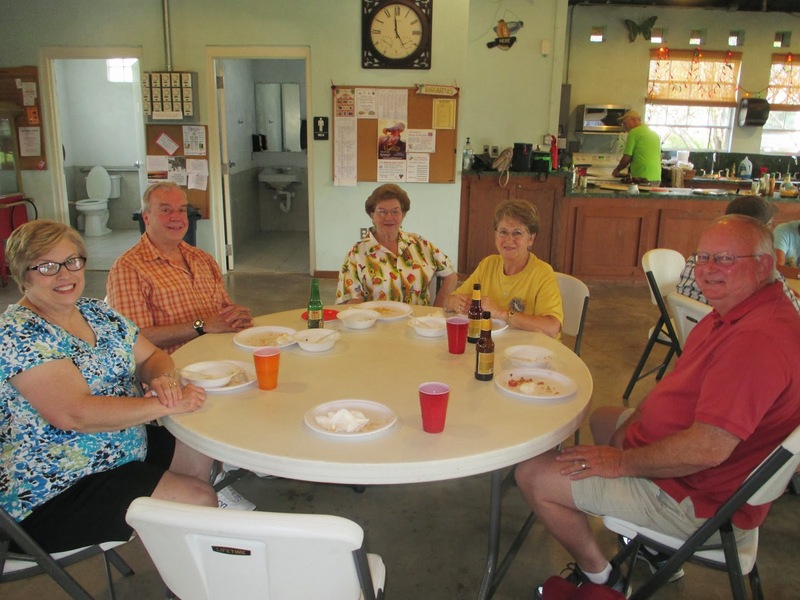 We were joined by Heinz and Irene, as well as Ron and Verna. Ed taught us a game called Farkle, played with six dice. It turned out that he had made up some of his own rules in addition to the official ones, supposedly in the name of making the game more interesting. We suspected fraud, of course, but played according to Ed's rules anyway. As it turned out, he was exonerated by virtue of his miserable final score, which was only slightly less miserable than mine. Sandy, on the other hand, was the winner and demonstrated her good sportsmanship by declaring herself "Farkle Queen for Life" and demanding that I call her a limo, which I promptly did, to her face. That's the last thing I remember. 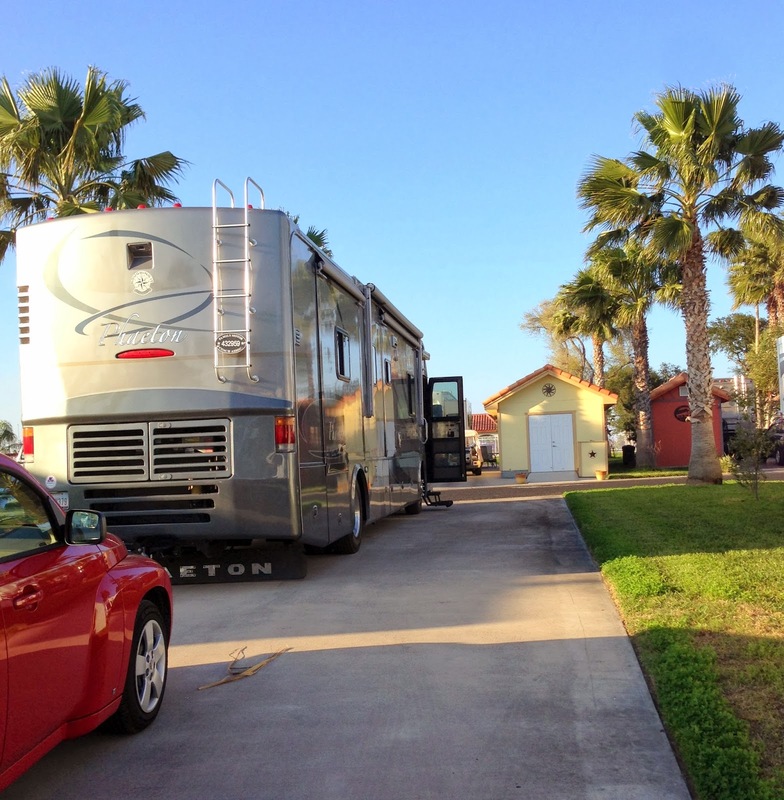 Today's adventure included a drive over to Bentsen Palms RV Resort in Mission, courtesy of Ed and Marilyn and Casper, their faithful Ford Fiesta. Most of the gang of RV friends who run around together down here (and us!) 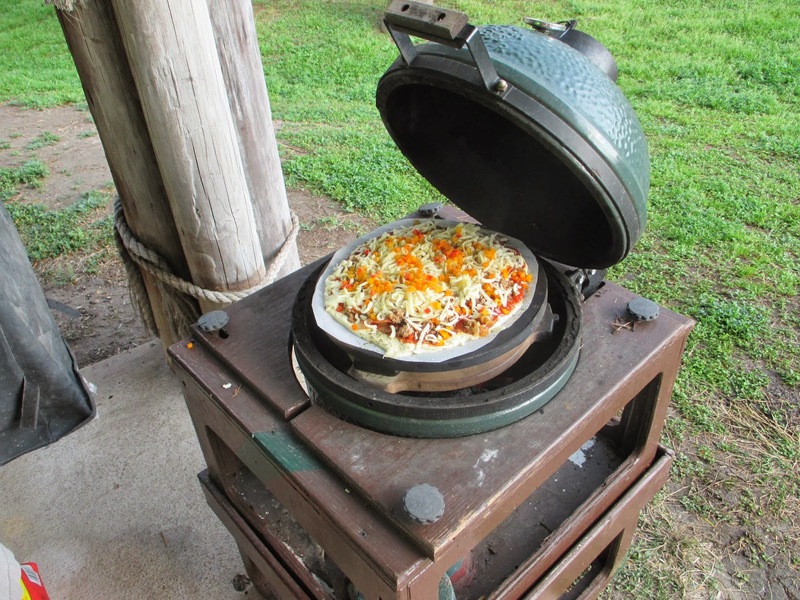 were invited by Bob and Janet for homemade pizza, which Janet and Ginger put together and Bob expertly cooked on a "green egg" smoker. It was some fine vittles for sure, accompanied by a nice salad and brownies. Ed also gave us a tour of Retama Village, an upscale development with owned real estate, mostly RV owners. After polishing off the pizza, we sat around and told stories with much laughter and putdowns galore. It was so great to be included in this merry band of retirees, many of whom--like us--will be heading back northbound this weekend in search of springtime. Thanks to all of you for your kindness in inviting us to your shindig; we really enjoyed ourselves. Our esteemed hosts, Ed and Marilyn, promised plenty of activities while we were here, and they certainly have made good on that statement; we have certainly had plenty to see and do. The first event today was to attend the South Texas Barbecue Cookoff held at the fairgrounds here in Mercedes. This competition had a grand prize of $10,000, and there were scores of cooking teams all around the fairground with every imaginable type of smoker. The only common element seemed to be, well, smoke, and there was plenty of that wafting around all the visitors. A number of the contestants were showing their college colors on flags above their stations. 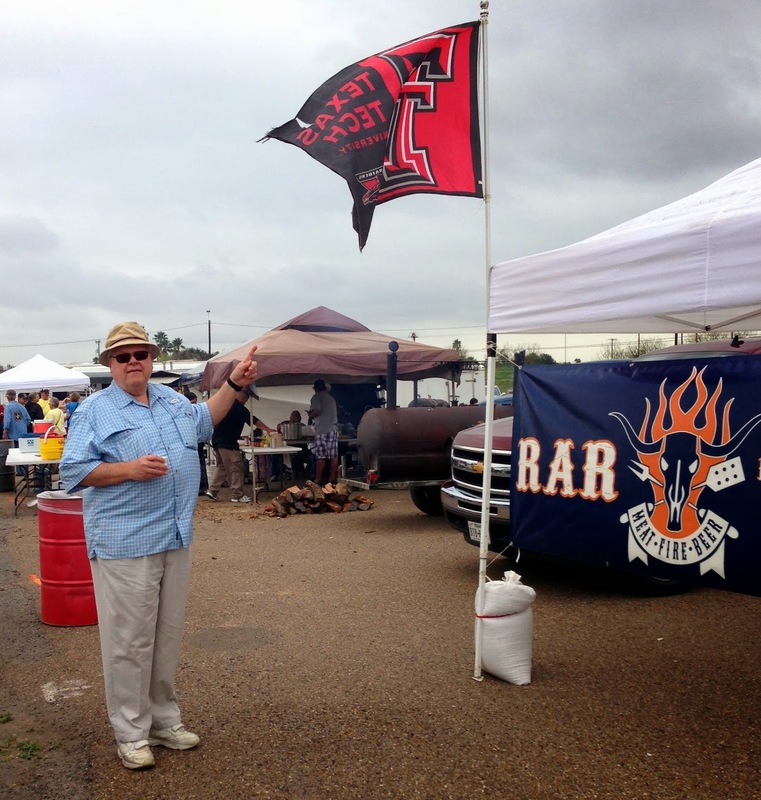 We took a photo of this Texas Tech alumnus's tent just for Bubba's enjoyment, since he couldn't be there with us. Below is a fairly ramshackle cooking rig that was designed to look that way; pretty interesting bit of showmanship, in my opinion. Below is a photo of Ed having patiently waiting for a sample of chicken from this group comprised mostly of teenagers. I tasted it, too, and found it superb--very moist and flavorful--even the white meat. We left the fairgrounds before the judging was over, so we don't know who won, but it was most interesting to investigate the myriad of equipment and processes used to try to produce a winning piece of barbecue! The main activity at Llano Grande this evening was a dance featuring 50's, 60's and 70's music--perfect for us geezer baby boomers! The band was great, and we all had a good time. 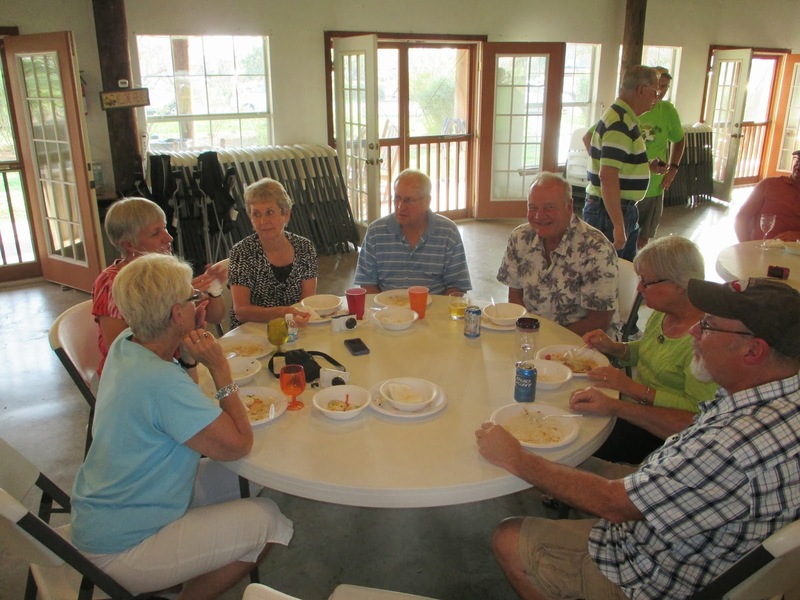 Ron, Verna, Heinz, Irene, Ed, Marilyn and Sandy - What a Fun Group! Today began in a fairly unusual way: Ed, Marilyn, Ron, Verna, Heinz and Irene went to jail! Now before you swallow your chewing gum, let me hasten to explain that they decided to go and take a tour of the jail. Okay, whatever. Heinz said it was interesting, but I am not exactly unhappy that I missed it. It's amazing, if not troubling, what we retired folks will do to amuse ourselves, isn't it? 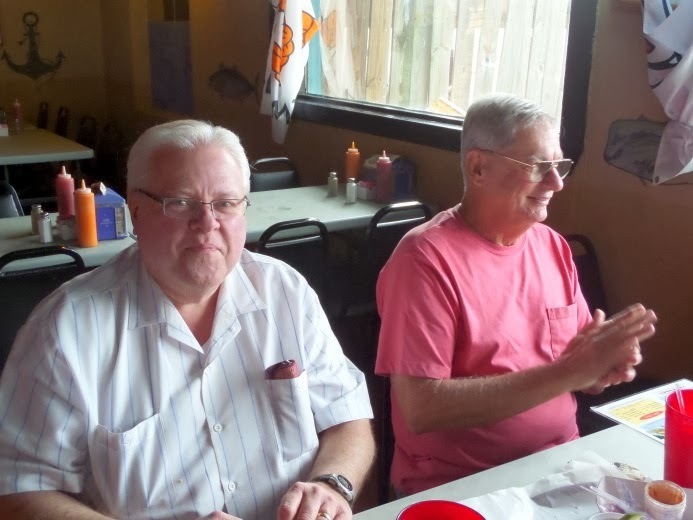 After the jail tour, Ed, Ron, Heinz and I decided to go stag to eat barbecue at Smokin' Joe's while the ladies went shopping. Normally, turning the girls loose for such a purpose would cause a loss of appetite for us, but it turned out not to have that effect. Smokin' Joe's was touted as having some really fine 'cue, and our taste buds were all set for it. Now it was Ed's turn to drive, so we all had the feeling that his being behind the wheel could mean the restaurant would be closed, so we weren't terribly surprised when that turned out to be the case. Once again, Ed holds onto his reputation as a jinx when selecting places to eat. The guys warned me that Smokin' Joe's was a backwoods joint that really should be classified as something below a dive, and they weren't kidding. This joint is PRIMITIVE. However, my guess is that it really lives up to its hype. I wished Ed hadn't been the one to suggest it, so I might have had a chance to try it. We decided to stop at Nana's Taqueria for lunch; this is a small joint in back of a house that is run by a local family. Tacos were good, plentiful and cheap, a winning combination. We returned to Llano Grande afterward with a nap in mind, but I took the opportunity to put together a new Weber Q propane grill that I had ordered. I had roped the guys into helping me transport the big box from the office to Phannie, using Ed's truck, Heinz's brawn and Ron's…well, it was not entirely clear what Ron's contribution was; he claimed to be supervising, but I have my doubts. 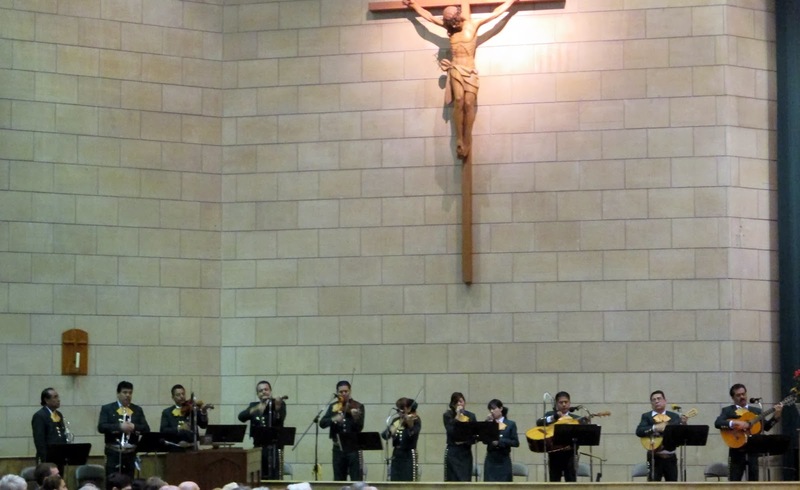 Later in the evening, the eight of us attended a mariachi concert at the Basilica San Juan. The groups were comprised mostly of very talented high school students whose performances were amazingly good. We enjoyed this greatly; I think it would be impossible to listen to this music and not have a smile on our faces. What a good day! Tomorrow is the barbecue cookoff, and I plan to be hungry. 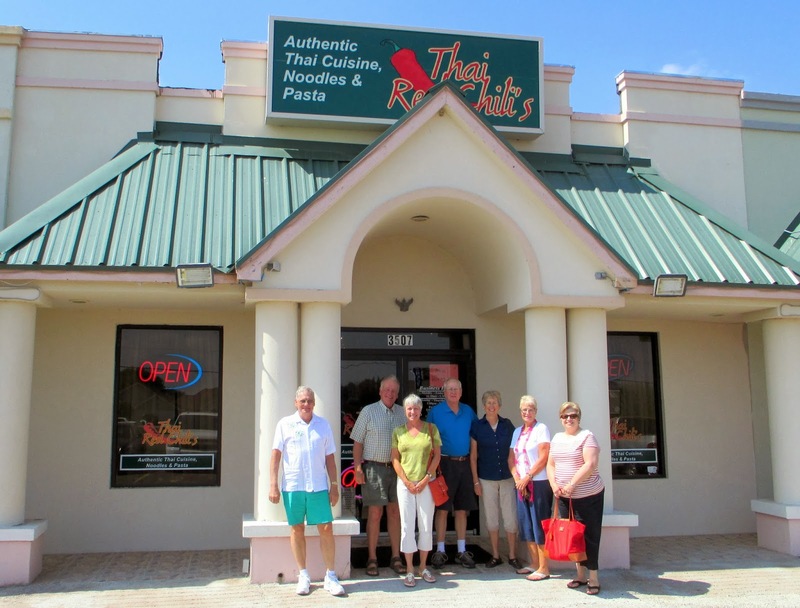 Some of our friends had had little exposure to Thai food, but their clean plates afterward seemed to indicate it may not be their last. 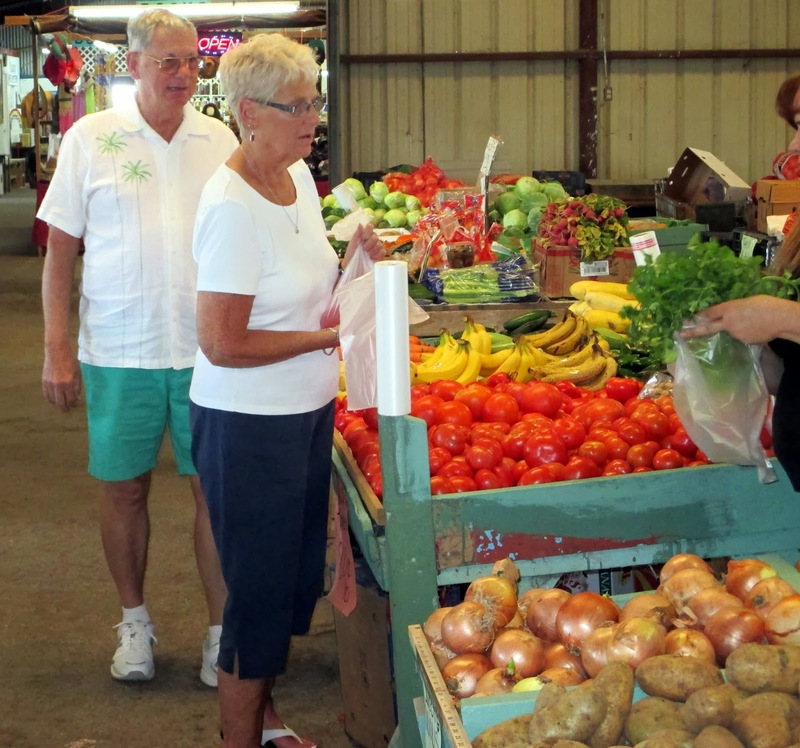 After lunch, we stopped at the local farmers' market, so we now know where to go to get farm fresh produce and fruit. We will be taking some of these goodies back with us in Phannie when we head north in a few days. As we drove toward the park exit, we suddenly spotted our group sitting outside what turned out to be Heinz's and Irene's actual RV. We stopped quickly, grabbed our chairs and sat down, accusing our friends of performing some kind of RV shell game to keep us away. They gave it right back, of course, calling into question my navigation skills from my flying days. Ed and Irene demonstrated a card trick and mind game that were entertaining enough to help me forget (almost) the obvious snub from earlier. As always, there were lots of good laughs all around, and we soon called it a day. The enjoyment of this day underscores the satisfaction of being content with simple pleasures and the gift of a merry heart. Having escaped the clock-driven frenzy of working to acquire stuff, I am so much more aware of the importance of celebrating a peaceful existence, love for God, family and friends and helping others, as I believe God would have us do. May all who pass this way be so blessed. The trip to Padre was uneventful, and we enjoyed seeing this part of the state that somehow had eluded us native Texans for some reason. We were immediately struck by the clarity and aqua color of the gulf waters at this location. We were more accustomed to the rather unattractive surf at Galveston that was mostly the color of dishwater, so this was really a nice surprise. 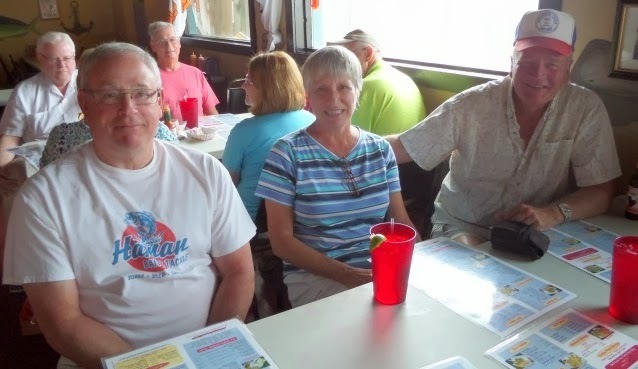 Our first stop was Dirty Al's, a legendary seafood restaurant frequented by Ed and Marilyn and those who have the good fortune to accompany them on this little side trip. 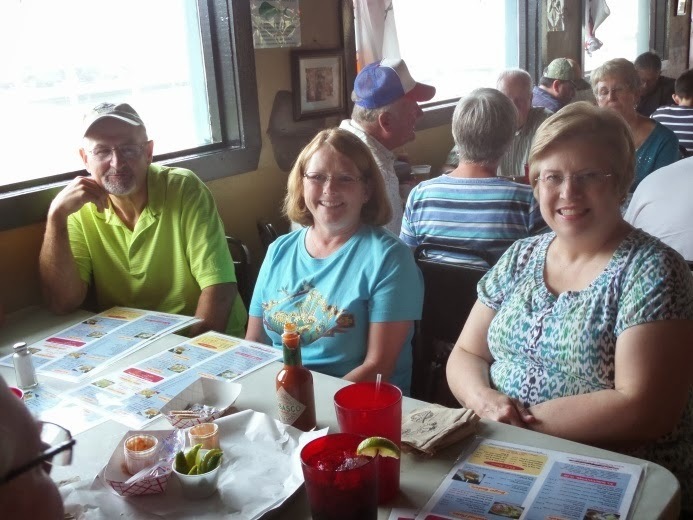 The food was just as good as advertised, and most of us made short work of the excellent fresh seafood. There were generous portions of french fries left over for most of the food orders, and Sandy and I were somewhat taken aback when Janet pulled out a large freezer bag and began to confiscate all of the leftover fries from all our plates. We thought to ourselves that, while the fries were quite good, we couldn't imagine how Janet would find them so appealing as leftovers--especially such a large quantity of them! Good manners prevailed over our curiosity, however, and we kept silent. It wouldn't be long until the reason for the french fry caper would be revealed. After this fine meal, we hopped in the trucks and motored about five miles north to a spot where beach access was allowed. We parked the trucks on the beach and assembled our folding chairs in a semicircle to enjoy the perfect weather and the sound of the surf. It wasn't long until Janet produced the bag of purloined french fries and began tossing handfuls of them toward a huge flock of seagulls who obviously were not unaccustomed to begging for scraps from the tourists. With each toss of french fries, the flock would swarm our circle of chairs, quite reminiscent of the famed Alfred Hitchcock movie, gobbling up the fries with abandon. Jesse, always a bit offbeat, wondered if we might ought to toss them some Lipitor pills, too, after all these french fries. It occurred to me that one of us may fall victim to a certain bodily function of birds, who seem to exercise no discretion at all as to when or where they release their droppings. It has always puzzled me as to why they feel the need to launch one of their missiles in mid-flight instead of waiting at least until reaching the ground or a perch as any respectable animal would do. And, while I'm thinking about it, what do they eat that always seems to give them diarrhea? It was during my musing over these imponderables that two of the missiles found their targets, one on my freshly dry cleaned shirt and another on my brand new pair of shorts. Sandy immediately shrieked, jumped up and held her folding chair over her head in an attempt to save her new hat she had purchased just the day before in Mexico. Soon and mercifully, Janet exhausted her french fry stash, and the fickle gulls abandoned us, reverting to whatever gulls do whenever they aren't poop-bombing innocent humans--in this case, lining up on the beach, all facing south, as if they were expecting another group of french fry-toting doofuses to come their way. Adding to the indignity of my receiving catcalls from the others in our circle--none of whom were victimized by the aerial assault--was my realization that I needed to figure out how best to remove the little crap piles from my clothing. I couldn't quite bring myself to use my bare fingers or even to use my handkerchief, and Sandy was no help, as she was still standing there with her chair over her head, laughing along with the others. Finally, a good samaritan in our group--I don't remember who--produced a paper towel, and I was able to clean up the mess. Then the question arose among the others as to the configuration I would need to attain to be allowed to ride back to Llano Grande in my soiled condition. Two possible choices were offered: 1) I could ride in my underwear in the cab or 2) ride sitting on the fifth wheel hitch in the bed of the pickup. Neither of these appealed to me, and Ed finally relented, allowing me to ride in the cab so long as I sat perfectly still and didn't touch anything. On the way back to Mercedes, we stopped at Reyes' Seafood on the island to pick up some fresh shrimp, which we cooked later for dinner. It is so yummy to get these little morsels so soon after being harvested. Even with the seagull bombing, it was a fine day with lots of laughter among good friends, and another good memory was made for all. But I've decided I don't like seagulls. A shopping trip to Mexico was on the agenda today. Neither of us slept very well in anticipation of the inevitable sounding of the alarm on Sandy's iPhone. Apple tried to keep the alarm as pleasant as possible, so the sound supplied is quite subdued, almost if the phone were clearing its throat or saying 'excuse me' as if it really hated to disturb us. In fact, it was the fear of missing the alarm altogether that caused us to wake well before its scheduled time of 6:00 a.m. Drill Sergeant Ed would have been giddy to learn that his reprogramming techniques--obviously learned from a gestapo training manual--had had their intended effect. We were officially zombies, and it was only day two in the RGV! Once again, we summoned the will to get ourselves outside just as a large four-door pickup pulled up. Ed and Marilyn were sitting in the back seat, and a couple unknown to us was seated, chauffeur-like, in the front. "Ed has reinforcements," I immediately thought. I caught myself before giving a Nazi salute to what I imagined in my sleep-deprived delirium to be Ed's military staff car. Emerging from the truck, he introduced Ron and Verna, friends who were escaping the winter cold in Llano Grande away from their home in Missouri. These folks turned out to be a very pleasant couple, joining us on our trek to Nuevo Progreso which, like us, they had never seen before. The big draw for winter Texans, or snowbirds, to visit Mexico is the bargains, of course. We stopped in a bakery for a little early snack and were serenaded by some excellent mariachis (I love mariachis). Sandy dropped off a prescription for new glasses at the office of a local optician, whose price was less than half the cost in the U. S. She also sat with the rest of the group for a pedicure and foot massage (only $12). She also picked up some medications at a local pharmacy, saving several hundred dollars over U. S. prices. We had a very nice lunch at Arturo's, then a bit more shopping before heading back across the border. Somehow, Ron and Verna got separated from the group and, unable to find us, made their way back across the river to his truck, thinking we might have been waiting there. We weren't. Instead we were propped against the sidewalk window of one of stores in Progreso, growing older at a time of our lives when every minute counts. Finally, we decided to walk back across the border to where Ron's truck was parked, as that was pretty much the only option left. We would need to get started if we were going to have to walk back to Llano Grande! Calling on the cell phones would have solved the problem, of course, but visitors to Mexico--cheap ones like most of us, that is--usually don't carry them there to avoid exorbitant roaming charges. Upon reuniting with Ron and Verna, we ribbed them unmercifully for abandoning us in Mexico. They were very apologetic, but there was no harm done except laughter pains. We decided the whole incident could have been avoided if Ed had devised a better plan for mustering the group in case we got separated. For Ed, who enjoys a reputation as a quintessential planner, this must have been a dark day indeed. 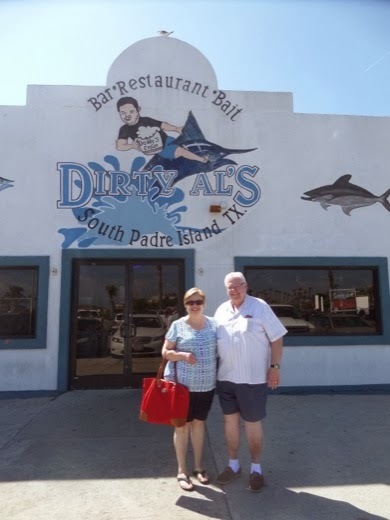 What a fine adventure we had today, and Tuesday will be a trip to South Padre Island for seafood and surf watching--sounds great! We're not leaving until 10:00 a.m., so I'm not sure what Sandy and I will do with all the extra time to get ready! 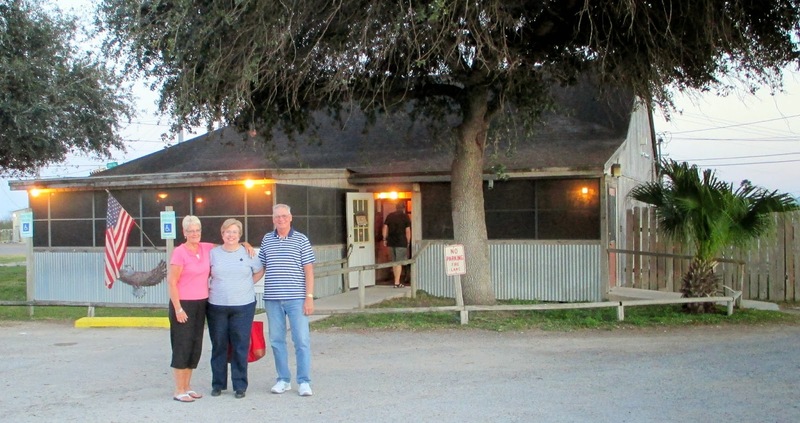 After a windy drive through the nondescript south Texas plain on Highway 77, we arrived at Llano Grande around 5:00 p.m. on Saturday. Ed and Marilyn were waiting for us at the registration center and led us to our site, only a couple of streets north of their location. 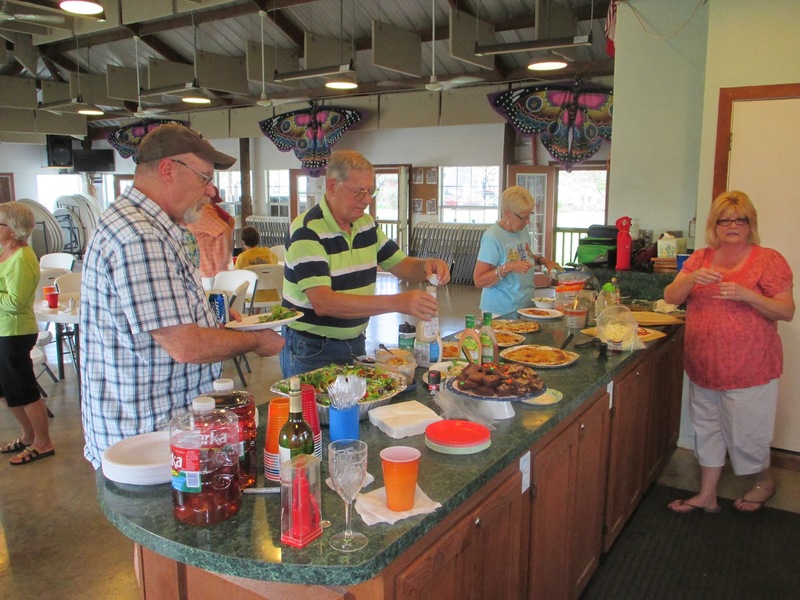 This is one of the nicest RV parks we have ever seen, and it is easy to see why our friends return year after year. I'll have some more photos in future posts. Our space at Llano Grande. Love the palm trees! Ed took us to Fat Daddy's, a burger and barbecue joint not far from our park, and we all had a nice meal and did some catching up. Ed had previously supplied us with a 'schedule of events' for the first week of our stay here, and we talked about getting an early start each day, a phenomenon that we knew was standard operating procedure for these folks. I reminded him of my confession in a previous post that Sandy and I had devolved into sloth-like creatures upon my retirement, thus celebrating not having to get up early by not getting up early. It's not something I'm proud of, but my shame is mitigated somewhat by my great satisfaction in thumbing my nose at the infernal alarm clock that had been my morning nemesis for oh, so many years. Having arrived on Ed's turf, it was now time to 'man up' and abide by the rules, however silly, of my host. I thought for sure this is what arriving at boot camp must have been like. I didn't complain, though, for we were grateful for their interest in showing us around. I did mention to Ed that we had been unfairly portrayed in his blog as sleeping until noon each day. That was a blatant exaggeration, I told him; we have never slept later than 10:30 since I have been retired! Ed was unmoved and even repeated this wicked falsehood in a subsequent post. Well, Ed is not without a few foibles of his own, so he will be fair game now in this rag. After not getting enough sleep to recharge a fruit fly, Sandy and I rolled out of bed, bumping into each other and commenting that neither of us had taken a shower before in Phannie when it was dark outside. Somehow, we were able to get it together and exited our rig just as Ed and Marilyn pulled up to our site at 0800. I didn't have to look; Ed was there exactly on time as I knew he would be. I thought to myself how funny it would have been if someone had let the air out of his tires. Then I thought it probably wasn't a good idea to think impure thoughts, as we were on our way to church. 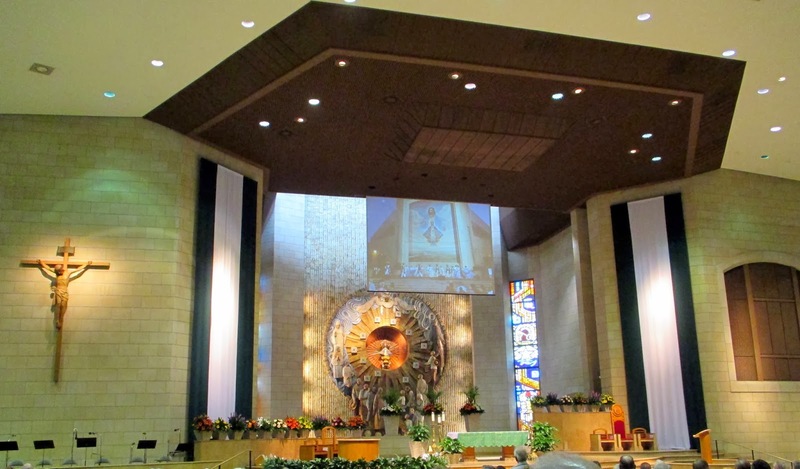 We made our way to the Basilica of Our Lady of San Juan del Valle, a very large and beautiful church seating over 2,000 worshippers. It was filled to capacity, and the music was provided by very talented mariachis. We found the service and the sermon to be unique, moving and inspiring. Marilyn gave us a tour of the building, and we enjoyed that, too. Ed then drove us to the Don-Wes flea market nearby, where we looked around at the myriad of things offered by the vendors. It was within the market that Ed had proposed lunch at the Bean Pot Cafe, an outreach of a local Christian organization. Naturally, it was closed, leaving intact Ed's growing reputation of forever selecting restaurants that are closed or out of business. Perhaps to assuage his guilt somewhat, Ed bought us a sack of freshly cooked mini-doughnuts, which were delicious. This nice gesture brought us close to forgiving him and delayed our collapse from starvation long enough for him to locate another eating spot for us. This one was a winner for sure; Don Beto's was very crowded, and we all ate until stuffed. Sandy and I agreed this was definitely some of the best Mexican food we have had, and you can bet we will patronize this place again before we leave the RGV. Ed, all is forgiven; you outdid yourself with this pick. After returning to Phannie, Sandy and I sat in the recliners and conked out for the rest of the afternoon, after which, Sandy was revived enough to go shopping for stuff for the grandkids--one of her favorite pastimes. Then we watched Downton Abbey and prepared for another early departure the next day, this time for Nuevo Progreso, just across the border in Mexico. Ed, ever magnanimous, informed us that we could 'sleep in' in the morning--we would not be leaving until 8:30! What a swell guy. We delayed our departure from home a couple of days to allow for the persistent cold and dreary weather to improve. We prepped and loaded Phannie on the day before launch day, but we still found a lot to be done before we could close up the house and pull away for another month on the road. Sandy, as usual, agonized over her wardrobe selections, proclaiming that it is just not possible to carry the "right" clothing for a warm destination when there is the probability--especially given this extreme winter--that it could be quite cold at any time and blow up her whole plan; it is February, after all! Jokingly, she wondered aloud if it would be feasible to tow an enclosed trailer along with Mae, so that she could just take all her clothes. Calculating the length of a 40-foot motor home pulling a tow car and a trailer, I told her gently that she might want to consider a different plan. After much gnashing of teeth and uncountable substitutions of one garment for another, she came up with what turned out to be a quite reasonable collection that fit nicely in the two-thirds of Phannie's bedroom closet normally occupied by her clothes. As for me, it took about ten minutes to assess my wardrobe, make any needed adjustments and put the final pieces in Phannie's closet, all accomplished smoothly and without any forethought. This caused Sandy's eyes to roll back in her head like the wheels on a slot machine and to issue a rebuke for my insensitivity. She thought it would have been much more chivalrous if had at least scratched my head a bit. I considered reminding her that, for women, proper clothing fit would always be a problem since God created woman from a crooked bone--a man's rib. Then I thought better of it as my survival instinct kicked in. Sandy is a really sweet person who puts up with more of my mischief than she should. Happily, she is not above a bit of mischief herself and gives as good as she gets. We were clearly meant for each other. We have had a nice but much too brief visit with the kids, and we'll be leaving today and pointing Phannie toward Mercedes, Texas and the Llano Grande Resort for a couple of weeks. We'll get a late start from Houston after having lunch and saying our goodbyes, then we will have a short leg to Victoria for an overnight stop. We're looking forward to joining good friends Ed and Marilyn and their band of merrymakers on Saturday.